As my 15-inch 2.3GHz Retina MacBook Pro approaches its second birthday, I’ve become more and more curious about the general health of the built-in battery. Battery Diag (Mac App Store link) is a simple and good-looking utility for quickly checking basic battery stats. Battery Diag is usually $2, but is currently free for a limited time. Battery Diag is much easier to read than Apple's System Information app. Battery Diag displays much of the same battery data that you can find using OS X’s System Information app (in Applications > Utilities). But instead of forcing you to dig through all the screens of System Information, Battery Diag presents the most important battery stats with just a click on the utility’s menubar icon. Specifically, Battery Diag displays the battery’s charge capacity (Battery Capacity)—which on an older laptop is likely less than 100 percent—and the amount of charge remaining (Current Charged), both as percentages and in actual milliamp hours. The app also provides four easy-to-read status icons for power source, battery health, cycle count, and time remaining (when unplugged) or time until full (when plugged in). If you move your cursor over the Health or Cycles button, a help tag appears to offer more info about those particular statuses. 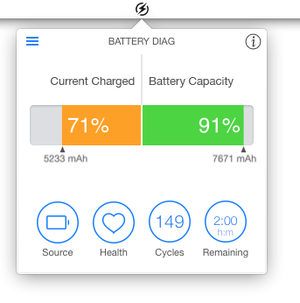 Click the Info (i) button to see more data about your MacBook’s battery. You can get a few more data points if you click Battery Diag’s Info (i) button. The resulting view displays the capacity of the battery—the original maximum, current maximum, and current level—the battery temperature, and the amount of power being used, and well as some other info that’s also available on the main screen. Battery Diag displays the same information as previous Gem Battery Health ( ), but in a nicer-looking way. Battery Health offers more info, and is a better diagnostic tool—for example, it reports real-time power usage, and it estimates how long your battery will last while performing particular types of tasks. It also provides tips for getting more out of your battery. Battery Diag offers three different color themes, including this one called Dark. Help tags show you what some of the information means. You might not care about the additional data Battery Health provides—if changing the way you use your particular laptop isn’t an option, that data isn’t very useful. If you’re mainly looking for a quick and easy way to see basic battery data, Battery Diag does the job well, and with an attractive interface. 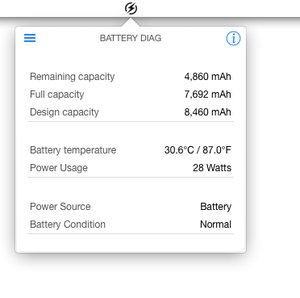 Apple's System Information utility provides detailed battery statistics along with myriad other numbers and specs. 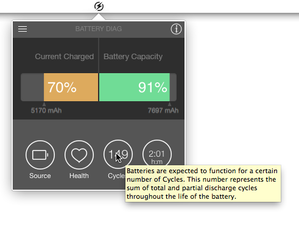 Battery Diag puts the most-important battery info just a click away in the menu bar.